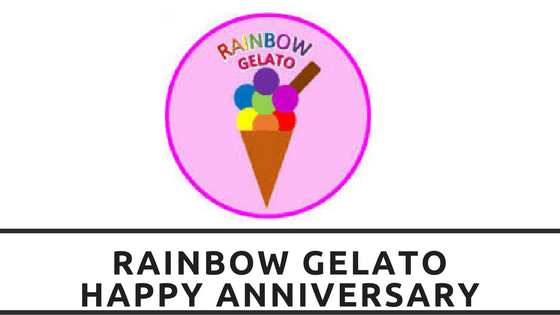 Rainbow Gelato – Happy Anniversary!! On 27th March 2016 it will have been 1 year since the people of Guiseley, Yeadon, Rawdon and beyond welcomed Rainbow Gelato to the number of food outlets in the area. Serving ice creams and gelato in an unending amount of flavours personalised anyway you wanted it alongside teas and coffees as well as their very own rainbow slush it is no wonder this little ice cream shop became a family favourite very quickly. We were asked on behalf of Guiseley Gazette to go and meet Paul and Andrea of Rainbow Gelato to discover why they opened the shop and what the future may hold for them. Paul has spent 35 years in the ice cream industry, starting with a van around local parks and public places, serving a limited amount of ice treats. Fast forward a few years later and with the support of his family, he and his wife Andrea made the decision to turn their mobile business into a more brick and mortar style business. Originally they looked in a shopping centre in Harrogate but due to certain logistic issues it was agreed that Yeadon, a more local town, would become the base for their operations. Thus the opening of Rainbow Gelato on Ivegate Yeadon occurred. Originally they started with flavours that their friends and families enjoyed as well as classics such as vanilla and strawberry, taking into consideration the different groups of individuals they would be serving such as children after school, or the elderly early afternoon but before long found inspiration in their customers, with many eager to share their favourite flavor ideas. The introduction of milkshakes and smoothies has slowly happened over last season and this season with many new flavours available. They like to keep things fresh and interesting so mix up the flavours every week allowing for something new to entice the customers. They even offer Ice cream tubs for birthday parties with a mobile freezer and delivery to the party location. Paul and Andrea believe in providing a friendly and enjoyable experience for all their visitors no matter who they are, even the littlest of customers who cannot decide between strawberry and raspberry. When Paul used to run around in his ice cream van he also supported the community as much as possible and still continues to do so by sponsoring local groups, supporting schools in their fundraising activities and much more. This season one of their newest additions, which was tested near the end of last season, is their Knickerbocker glory range. Another addition is something that many in the area will welcome is the introduction of gluten free ice cream cones!! Due to arrive in the next month or so. Hunt the Bunny Feet Competition – The winner gets a large Movie Night Package with Slushes, double scoop ice creams and popcorn buckets. Would you like a write up similar to this for your business? Then please get in touch with RedRite for more information.